LOCATION.--Lat 40°08'48", long 74°07'20" referenced to North American Datum of 1983, Wall Township, Monmouth County, NJ, Hydrologic Unit 02040301, on left bank just downstream from pumping station of Manasquan Water Supply System, 1400 ft upstream from Hospital Road, 1.1 mi west of Allenwood, 1.2 mi downstream from Mill Run, 2.2 mi east of Squankum, and 7.9 mi upstream of mouth. 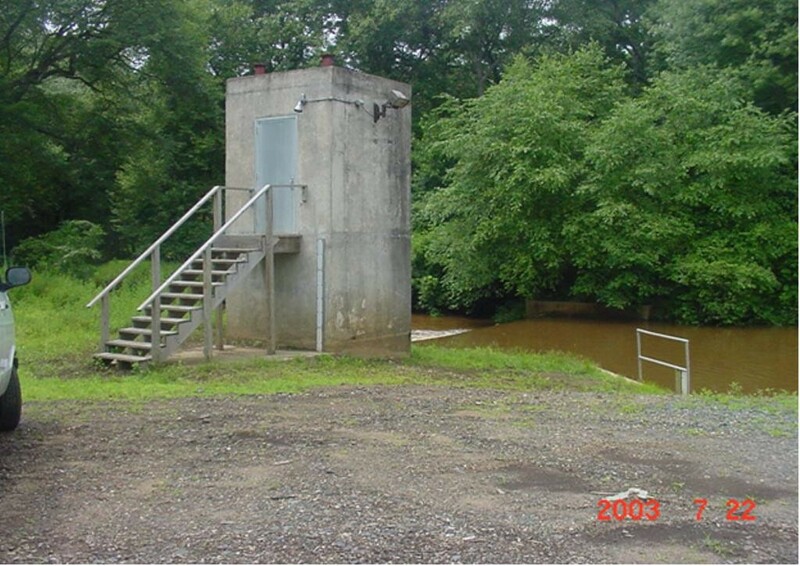 PERIOD OF RECORD.--Annual maximum gage, 1969-1996, published as Manasquan River at Allenwood, NJ (station 01408030) at site 1,400 ft downstream. Continuous-record discharge station, June 1990 to current year. REVISIONS HISTORY.--WDR NJ-92-1: 1991 Diversions. GAGE.--Water-stage recorder with telemetry and concrete control. Datum of gage is NGVD of 1929 (New Jersey Water Supply Authority benchmark). REMARKS.--Records good, except for estimated discharges, which are fair. Diversion by New Jersey-American Water Company from Manasquan Reservoir since 1990 and by Manasquan Water Supply System just upstream of gage to Manasquan Reservoir for municipal supply since March 1990. Discharges above 3,900 ft³/s from rating curve extension on basis of logarithmic extrapolation. EXTREMES FOR PERIOD OF RECORD.--Maximum discharge, 12,600 ft³/s, from rating curve extended above 3,900 ft³/s on basis of logarithmic extrapolation, Aug 28, 2011, gage height, 20.38 ft, from high-water mark; minimum discharge, 0.00 ft³/s, Jun 24, 1993, result of pumping to Manasquan Reservoir System or Glendola Reservoir. Specific Conductance: December 2006 to current year. Water Temperature: December 2006 to current year. Turbidity: December 2006 to current year. REMARKS1.--The accuracy of continuous water-quality data can be found here. SPECIFIC CONDUCTANCE: Maximum, 3,100 microsiemens/cm, Mar 3, 2015; minimum, 62 microsiemens/cm, Dec 12, 2008. WATER TEMPERATURE: Maximum, 25.4°C, Aug 14, 2016; minimum, -0.1°C, first occurring on January 1, 2014 . TURBIDITY: Maximum, 550 FNU, Apr 30, 2013; minimum, 2.7 FNU, Sep 6, 2007. National Weather Service flood stage for this gage is 14.5 ft.